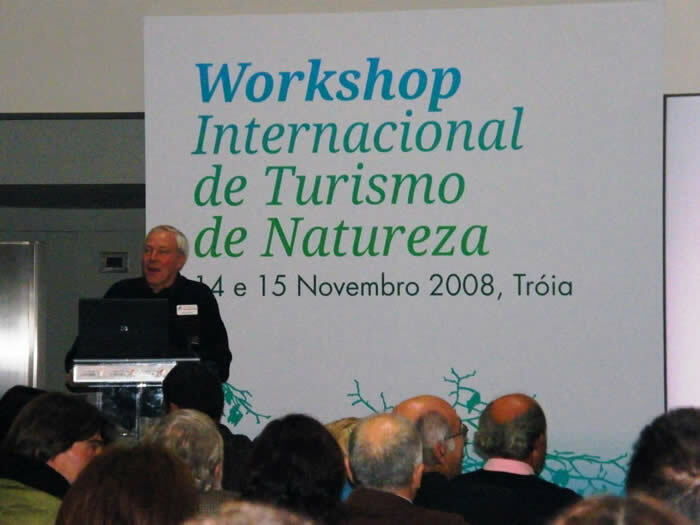 I was in Tróia near Lisbon in Portugal during November to give a presentation to an 'International Nature Tourism Workshop' run by the Portugal Tourist Board and SPEA, the Portuguese BirdLife partner. There is much less wildlife tourism in Portugal than in its neighbour Spain, and the Tourist Board has picked out "Nature Tourism as one of the 10 strategic tourism products that should underpin the development strategy of national tourism". I don't feel I'm a natural for the international conference circuit: being met at the airport by a chauffeur-driven Mercedes was frankly a bit of a culture shock, but tempered by having RSPB colleague Jose Tavares also meeting me there; somehow our paths hadn't crossed before, other than to compare notes by email before this event. Read more about the conference here and what I said here. Two nice surprises for me in Portugal: a hovering black-shouldered kite on the Saturday morning excursion to the Sado estuary (though I missed the bluethroat). Even better was Deric and Kate Brown from the Hotel Belavista, Honeyguide's base in Algarve, walking into breakfast at the conference. Honeyguide was pleased partly to sponsor a book on the Dragonflies of Lesbos by John Bowers of Friends of Green Lesbos. This is now published: click here to read more Please drop me a line if you'd like to order a copy. Cévennes recce: I recently spent a delightful few days in the Cévennes with holiday leaders Robin and Rachel Hamilton. It was rather wintry weather so flowers were largely over and there were almost no butterflies, but the potential was clear. Read about the visit here. Birds included plentiful griffon vultures, black redstarts and cirl buntings; crag martins, hawfinches and a late short-toed eagle over the causse near the captive-breeding programme for Przewalski's horses were nice surprises. When Robin and Rachel were last there, the La Gare aux Ânes - the donkey station - was a restaurant with a reputation for fine food and proprieter Sylvain Goleo was preparing the rooms for a small hotel. This is now up and running in an attractive and highly individual style and I can confirm that the food is first class. 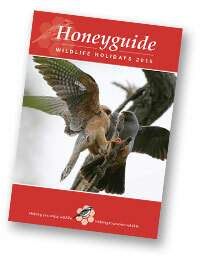 Honeyguide’s brochure for 2009 was posted in late September, so if yours hasn't arrived please contact the Honeyguide office. Anyone keen to book without a brochure can download a booking form from the Booking page on the website – or simply phone or email to reserve your place. Welcome to travellers with Gullivers: the latest Honeyguide brochure was sent to former travellers with Gullivers Natural History Holidays. This is by kind arrangement with Bob and Jacky Gulliver who ran their last holiday a little over a year ago, before retiring to Norfolk. This was arranged very recently and it hasn't been practical yet to eliminate all duplication between the Gullivers and Honeyguide mailing lists. Our apologies if you get two brochures, and naturally we'll be pleased to know. ATOL protection: we welcome the new ATOL Protection Contribution (APC), a new £1 per person charge to cover contributions for air packages covered by an Air Travel Organiser's Licence (ATOL). Some tour operators or travel agents may choose to add this to, or itemise it on, invoices. The APC is automatically included in the price of Honeyguide wildlife holidays. [Webcams 2009: Our favourite webcam is up and running on the white stork nest in Markt Schwaben in Germany, the home town of Honeyguiders Karin and Brennan – click here. There are now three steadily growing chicks, having started with four, though it was tricky to count them – what do you think? More storks on a webcam - here - on a nest on a power line in Portugal. Double-click on the image and it goes full screen.